The Sussex Branch Trail showcases one of the premier rail trails in the Skylands regions of NJ. Formerly the Sussex Branch of the Delaware, Lackawanna, and Western railroad, this line is steeped in history as well as remarkable scenery. With only a few short interruptions, it is possible to trace this abandonment over twenty miles between the towns of Netcong and Branchville. This section of the Sussex Branch Trail follows the route through Sussex County from Byram Township in the south to Branchville Borough. This section of the Sussex Branch Trail also got its start providing service in 1848 as the narrow-gauge, mule-drawn Sussex Mine Railroad, whose primary purpose was hauling iron ore from the mines in Andover to Waterloo Village on the Morris Canal. The railroad was eventually upgraded and expanded before being merged into the Delaware, Lackawanna and Western Railroad in the mid-1940s. 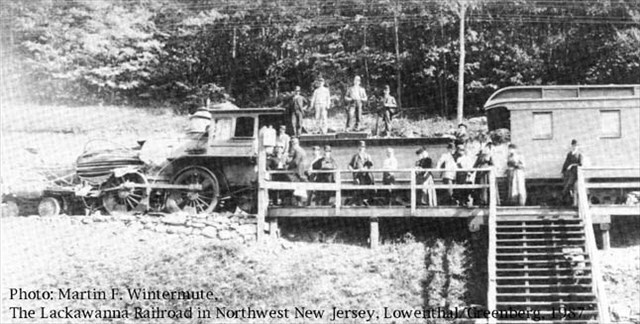 Though the railroad was out of service several decades later, the state of New Jersey—which owns much of the area parkland—preserved the right-of-way for trail use. Superintendent Reasoner has issued an order since the explosion of the locomotive at Waterloo, "that no person, except the road master, or foreman on their own sections, will be allowed to ride on the engines on the D. L. & W. R. R. without permission from the Superintendent or master mechanic." The order states that this rule will be strictly enforced.